Dr. Ward graduated from the University of Kentucky in 1982. He attended Southern College of Optometry in Memphis,Tn and graduated with a doctorate in Optometry in 1986. He has been in private practice in Danville since 1987. He is a member of the American Optometric Association and the Kentucky Optometric Association where he served on the board for 7 years. Dr. ward currently serves on the Danville/Boyle Co. Health Department board and Farmers National Bank Community board. He is also a member of the Danville Rotary Club. He and his wife Patty and their three children are members of the Presbyterian Church of Danville. Maranda has been with Ward Vision Center since April 2016. She has over 5 years experience in customer and patient care. Kristy has been with Ward Vision Center since December 2014. She has over 10 years experience with Insurance Billing. 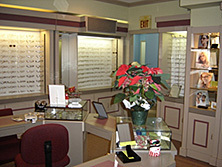 Karen has been with Ward Vision Center since April 2006. She has over 15 years experience in the Optometry field.